Olives soaking up herbal flavor while resting in extra-virgin olive oil is this week’s assigned recipe from Around My French Table and it came at the perfect time to enjoy for a pre Thanksgiving meal nibble. I found the Sicilian Castelverano olives at Whole Foods the day before Thanksgiving. The parking lot was so busy I had to valet my car to run in and buy 2 cups of olives! The store was packed before 9am, I think everyone had the same idea for an early start to their day. I had bought olives the day before when I went to pick up my bird but decided to make a second batch using different olives to create a sort of olive bar to go with the chunk of Manchego cheese I bought to go with the homemade quince jelly I made from a huge bag of quinces that I received from my son-in-law week last week. Once I get an idea about how I want to serve an olive or a cheese, no crowded grocery store can keep me from executing my plan! I hope everyone had a wonderful Thanksgiving day and is able to enjoy a relaxing weekend with their friends and loved ones. I bought tickets for an African Safari in the hills of Sonoma County, at Safari West. My husband and I are bringing our ‘littles’ on safari while their parents enjoy a weekend off. I’ll try to take some photos to share, should be pretty wild. These herbed olives are easy to make and lend themselves to all kinds of flavor combinations, I’ve included the recipe exactly as I made it but the possibilities are endless. As I mentioned above , I served my olives with slices of Manchego cheese, quince jelly (recipe coming soon) and crackers for a light but flavorful appetizer. 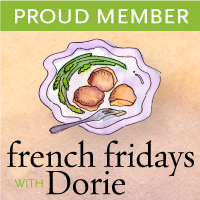 Please check out the other contributors to French Fridays with Dorie and have a wonderful weekend. Place the olives in a clean 1 quart canning jar. Remove the leaves from 2 of the rosemary and thyme sprigs-finely chop the leaves. Place a skillet over medium heat- when it's hot add the coriander seeds, peppercorns and fennel seeds, gently shake the pan until you smell their spicy fragrance and remove to a small bowl. Remove the pan from the heat and allow to cool for several minutes, then put it back over a low heat. Pour in 1/4 cup of the olive oil and add the remaining ingredients. Heat the mixture for a few minutes, until it's warm and fragrant. Pour the herbed olive oil mixture over the olives, adding enough of the extra olive oil to cover them. Let the jar of olives come to room temperature, giving a few stirs while waiting. The olives can be served now but the flavors will intensify if you seal the jar and hold it in the fridge for at least 8 hours or up to a few weeks. Hope you had a nice Thanksgiving, Patty! These olives are perfect for holiday gatherings! Hope you had a great Thanksgiving. I went shopping the day before Thanksgiving just after lunch and the store was oddly quiet – I felt very lucky! Olives are a new part of my holiday feast… These looks so vibrant and yummy. Happy Thanksgiving Patty! Your olives look irresistible! I bet they were spectacular with the Manchego cheese! little ones, sounds like fun. Patty, I’m so excited about this recipe. Our family LOVES olives but usually just eat them straight from the market – this will be a fun twist for the holidays, thanks! How gorgeous with your bright green olives and vibrant orange zest!! Your olive bar sounds perfect for cocktails before Thanksgiving dinner! Gorgeous olives. I hope you have a lovely, relaxing long weekend! Patty, the color of your olives is just gorgeous! I hope you had a lovely Thanksgiving. I’ve always wanted to go on an African safari. Good to know there’s one in Sonoma. That might be easier to get to than the actual African continent. Sounds fun! That sounds like fun for the little ones-can’t wait to see the photos! These olives are gorgeous. I usually never say that about olives and just enjoy the flavor. Great photos, Patty. A plate of olives, amazing cheese and bread and I am a happy lady! Your herbed olives are quite similar to the ones I’ve made before, except with Sicilian green olives. Just beautiful and perfect for the holidays. Have a wonderful weekend, Patty! Beautiful photos, delicious looking olives! I am looking forward to seeing your african safari pics, sounds like so much fun! Patty, hope your thanksgiving was a good one! Your olives look lovely! And ummm…can I bring my kids over there so I can have a weekend off as well? LOL! Those are wonderful, fat olives, one´s I hardly see here. We eat quince jam and jelly an lot here, and with cheese most of the times. Perfect idea with the manchego! I love your appetizer Patty. Have a great weekend! Patty..with your gorgeous photos and skills in the kitchen, you don’t need to make French pastry with pulled sugar – you already impress with your delicious looking treats. I’d trade my sugar hoops for your photos in a nano-second That said..I LOVE olives and have been gorging on a container of kalamatas and Spanish olives for a week now. I have to try these – they look sensational! I think I would have braved the grocery crowd to make these, too. I love marinated olives and I already have the manchego. The safari sounds neat. Got room for one more? Stunning clicks, Patty. I would love to make this too! Our whole foods has a small parking lot and I can only imagine the day before – you are one brave woman! Love the valet parking. Smile. I tend to almost always pick up these olives when I am there, since I don’t see them many other places. Your addition of flavorings to them is simply perfect. Your photos are stunning!!! Hope you had a lovely Thanksgiving Patty! I love those olives. They’re so meaty and have a different, fresher taste than the ones we’re more used to. Sounds like a perfect weekend! How fun. Your olives look beautiful. I loved this too. So brave to attempt the store at that time! Looking forward to seeing your quince jelly. The combination sounds terrific. Your olives must have gone so well with the cheese and quince jelly….they look terrific. Your olives look lovely – I have never heard of this type before and now am curious. I hope you had a wonderful Thanksgiving! Olives are always on our Thanksgiving appetizer tray, what a great addition these would be. Love the vibrant color of your olives, Patty! They look utterly delicious!! When I was a child we had a quince tree…my mother always made quince jam. I haven’t had quince in ages! Sounds wonderful…lucky you! Oh, my, Patty, I am quite impressed with your making your own quince jelly. I am not even sure I know what it tastes like. Quite the nice pre-Thanksgiving spread you offered your family. 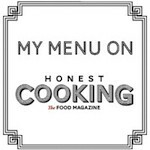 Okay, so many of us (food bloggers) are Type A-driven, I believe. If we have a plan, it needs to be executed. And, your result looks as if it was worth it. Hope you had fun going on the safari. I would have liked to tag along. I hope you had a nice Thanksgiving – and yes, please do share the safari pictures. I heard about this place but never been and I’m so curious! Herbed olives sounds delicious! I just need to find where to find these, and this will be a new favorite- I can tell they would never last in my house!